Fall is big game season for many outdoorsman. Whitetail deer, bear, elk and antelope are all considered big game and favorite targets for many Midwestern hunters. Experienced anglers also know that when the leaves start changing and the water temperature starts dropping, many of the top predator fish start fattening up for the long winter ahead. Muskies and large pike will start to feed more often, giving into the offerings of a 1 lb. or larger sucker minnow slow trolled or under a float. This change of seasons is also prime time to bring a trophy walleye topside. While many believe that live bait (meat) is key this time of year, that’s not always the case. As the water temperature drops into the 60’s and eventually the 50’s, it triggers a natural instinct in walleyes to start preparing for the winter, or in layman’s terms, time to start packing on some pounds. These fish are looking for large meals. The forage in the lake has been growing all summer, which means these super-sized walleyes are getting used to having super-sized meals daily. Jig and plastic, such as a 5” Berkley Ripple Shad or other large profile soft baits paired with lead head jigs and mimic fleeing juvenile fish are a great presentation when fishing cover, such as cabbage weeds, scattered coontail or downed wood. These baits will cast a country mile, allowing you to cover a lot of ground quickly while keeping your boat out of the “Fish Zone”. Even though the fish are feeding heavy, they will still get spooked easily. Crankbaits are another great option for covering water quickly, and with a wide array of sizes, colors and actions, there always seems to be a productive crankbait pattern sometime throughout the day on most every body of water. This might be over weed-tops, along deep weed-edges, over deep structure or on mid-lake transitions. Start out with different sizes and actions, and let the fish tell you how active they are on that particular day. Generally in the fall, we start with larger, aggressive baits like a Live Target Jointed Perch, Jointed Smelt, Reef Runner 800 Series or a Scheels Outfitters FatEye Deep Runner. All of these will give off large amounts of vibration and flash, plus when paired with the large profile, each would be a perfect meal for a big walleye. When these larger banana style baits won’t produce the desired results, the old stand by for many walleye anglers, shad shaped baits, should be the next choice due to a more subtle vibration (although, the larger sizes are still recommended). Remember, BIG Baits catch BIG Fish. As summer winds down and the temperature continues to drop, a walleyes live bait preference transitions from leeches and crawlers to minnows, big minnows. Again big baits catch big fish. Although smaller minnow species will still catch a few fish, larger species such as Chubs (Rainbow Chubs, Creek Chubs, and Redtail Chubs) and Suckers seem to excel. We generally prefer the 5 to 6 inch sizes, although 7 inch chubs will also attract some of the largest fish in the system. Pair these with a Lindy rig, consisting of a Gamakatsu #2 Finesse Wide Gap hook, a 3 to 5 foot fluorocarbon leader and a slip weight of your choice. We do recommend that if you haven’t tried the Wing-it Quick Swap weight system, to give it a try. It excels at this application because of its ability to change weight sizes quickly is a huge advantage in the fall when you could be fishing multiple depths on the same day. Your mainline can consist of either monofilament or superline, as they each have different characteristics that will help in different situations. Our recommendation is to use whichever line type YOU are comfortable with. 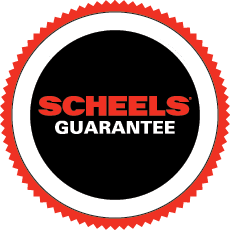 Rod choice is relatively simple, choose a high quality, sensitive rod such as the Scheels Outfitter ONE Series of rods works great for rigging applications. We prefer the 6’ 6” or 7”, Medium with Fast or Extra Fast action. Here are a few tips that will help your hooking percentage. Hook the minnows just through the top lip, and only the lip. This will allow the minnow to swim freely without damage to the minnow, and pay special attention to how active the minnow is. Many times they will struggle to get away from fish before the fish hits, sending a signal all the way up the line to warn you a fish is nearby. Some savvy anglers will occasionally feed line before the fish actually hits the bait. Another important tip, when you do feel a bite, is to feed plenty of line while hovering the boat over the area. Until you set the hook, it can take up to a minute for a walleye to get these minnows turned around in preparation to swallow them. For traditional walleye anglers, there is something special about feeling a large walleye grab onto a big minnow, and fall is prime-time to experience the tug. Hunting for big walleyes in the fall can be similar to hunting big game mammals. We wait all year for the opportunity. Searching for individual fish, putting yourself in position to contact the largest walleyes in the system, and most importantly, using large baits that these trophy walleyes can’t resist.